Browse: Home / 2018 / November / 21 / Is Dmitry Bivol the Best Light Heavyweight in the World? Is Dmitry Bivol the Best Light Heavyweight in the World? In March of 2018 I tuned in to watch Dmitry Bivol, the WBA World light heavyweight champion make his first defense against the highly regarded Cuban Sullivan Barrera, 21-1 (14), out of Miami, FL, and couldn’t believe how impressed I was with Bivol. Barrera is now ranked No. 4. Bivol was ahead on all three of judge’s cards, Julie Lederman, Joe Pasquale and Steve Weisfeld by the score of 109-100 going into the twelfth and final round when possibly the most underrated referee in boxing today, Harvey Dock, called a halt at 1:41 of the final round. Barrera hasn’t fought since and I can see why. He returned to the ring on November 3rd defeating Sean Monaghan, 29-2 (17), at the Aviator Sports Complex, in Brooklyn, NY. At the age of 15 Bivol was in his first major amateur tournament. Born in Tokmak, Kyrgyzstan, December 18, 1990, he is now a resident of St. Petersburg, Russia. His father is of Moldavan and his mother Korean descent. He entered the 2015 World Cadet Championship in Istanbul, Turkey. He stopped all three opponents, from Albania, Romania and Kazakhstan to win the Gold Medal. The following year in 2016 he would repeat winning the Gold Medal in Baku, Azerbaijan, defeating three boxers, from Ukraine, Kazakhstan and Serbia. In 2008 he ventured to Guadalajara, Mexico, soundly defeating boxers from Colombia, Slovakia and Mexico. Then he met up with the Cuban Rey Eduardo Recio and tasted defeat by decision. Welcome to the world of the country that still dominates the amateur rankings in Cuba. In 2012 Bivol won the Russian Nationals defeating all four opponents. In the same year he won the European Under-22 Championships in Kaliningrad, Russia, defeating opponents from Belarus, Finland and Maldives. In 2013 at the World Combat Games he defeated both opponents, one from Uzbekistan and current UK light heavyweight Jake Bell, 12-1 (9), as a professional. In Bivol’s last amateur tournament in 2014 at the Russian Nationals he won a Gold Medal defeating all four opponents 3-0. His overall amateur record was an incredible 268-15. Later that year in 2014 a month prior to his twenty-fourth birthday Bivol under management to Vadim Kornilov, trained by Gennady Mashyanov (since 2010) and promoted by Andrey Ryabinsky (since 2014) of World Boxing, made his professional debut in a scheduled six round bout stopping Jorge Rodriguez Olivera, 25-10, of Uruguay in the sixth round. In April of 2015 Bivol would stop Russian Konstantin Pitemov, 18-6, in the third round. Then in May he knocked out Joey Vegas, 17-10-2, of Uganda. In August he would venture to Costa Mesa, CA, making his first US appearance knocking out Mexico’s Felipe Romero, 19-8-1, to win the vacant WBC US Silver Title in his second scheduled eight rounder. In November back in Russia Bivol would stop Jackson Junior, 17-4, of Brazil, in the fourth round of a scheduled ten, for the WBA Inter-Continental title. In February of 2016 back in Costa Mesa, CA, he knocked out Cleiton Conceicao, 21-8-2, of Brazil, in four rounds. In May in Russia he won a twelve round decision over Dominican Felix Valera, 13-0, for the interim WBA World title. Valera is currently No. 6. 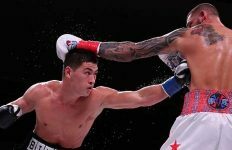 In a February 2017 title defense Bivol defeated New Zealand’s Robert Berridge, 29-5-1, stopping him in four rounds. This was the first of four fights in the year. In June he defended and defeated Samuel Clarkson, 19-3, stopping him in four rounds in Ox Mill, MD. He stopped Cedric Agnes, 29-2, in four rounds, in Las Vegas. In Monte Carlo he knocked out Trent Broadhust, 20-1, of Australia. Next up for Bivol is No. 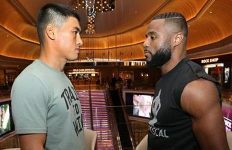 9 ranked and former WBC Light Heavyweight champion Haitian Jean Pascal, 33-1 (20), out of Quebec, CAN, on November 24th at the Hard Rock Hotel & Casino, in Atlantic City, NJ. It will be his third defense after defending his interim title three times. “We are looking to unify titles next year and Dmitry always talks about becoming the undisputed world champion in the light heavyweight division. 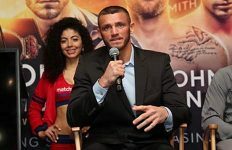 We will hope to make the first steps towards his goal next year if one of the other champions is ready for the challenge,” said Vadim Kornilov. The other organizations champions are WBC’s Haitian Adonis “Superman” Stevenson, 29-1-1, out of CAN, and Oleksandr Gvozdyk, 15-0, out of the Ukraine. IBF Champion Russia’s Artur Beterbiev, 13-0, out of Montreal, CAN, WBO’s Venezuela’s Eleider Alvarez, 24-0, out of CAN. “I am only one of the four best light heavyweights in the world because there are four champions in the division. If I can obtain all the other belts, than I will be the best,” said Dmitry Bivol.